It doesn’t really sound like something you’d think to eat. Charcoal? Why would anyone put that in their mouth? As a matter of fact, though, you’re already using charcoal as a purifier: it’s in most air and water filters. Even ordinary charcoal mops up impurities at an astonishing rate, and activated charcoal is like regular charcoal turned up to 11. It starts out as regular charcoal. Then it’s processed with oxygen to make it very porous (full of tiny holes) and give it a huge surface area. The large surface area means that even a very small amount of activated charcoal can pick up a whole lot of other stuff on its surface. Basically, it works kind of like a sponge for all kinds of things – that’s why it’s so useful in air and water filters. But the question remains: will it do the same thing inside your body? After all, you can also filter water by running it through sand, but nobody would suggest eating sand as a way to detox! Just because something works outside the body does not necessarily mean it will work inside the body. So take a look at the evidence we have about activated charcoal and whether or not it will really do you any good. Activated charcoal has a long history of use as a poison control drug (taken directly after poisoning as a form of damage control). It works by adsorbing the drug in the digestive tract. ADsorption (no, that wasn’t a typo!) is not quite the same thing as ABsorption, but it’s a similar process. Basically, the charcoal steals all the drug for itself, so your body doesn’t get any. For nutrients, this would be very bad, but for toxins, it’s great, because you don’t want to get any of them. Activated charcoal only works within one hour of poisoning. This means that it doesn’t act as an all-purpose “detox” for accumulated toxins over a lifetime. It’s a therapy for acute toxicity, the “whoops-my-toddler-swallowed-the-whole-bottle-of-Tylenol” scenario. There is no evidence to support using it in any other case. Not all toxins are adsorbed to charcoal. It’s useful for some common prescription drugs, like acetaminophen (Tylenol), but it’s useless against iron, lithium, petroleum products, and alcohol. Overall, the review was less than enthusiastic. And you should be, too. If you have acute poisoning, go to a hospital. If you’ve ingested something that responds to activated charcoal, you can get it there. If you don’t have acute poisoning, taking activated charcoal has never been proven to do anything at all. This study (1986) found that 8 grams of activated charcoal three times a day helped reduce total cholesterol (25%) and LDL cholesterol (41%). This study (1988) found that charcoal worked just as well as cholestyramine (a cholesterol-lowering drug) at reducing cholesterol levels: 22% for the charcoal and 16% for the drug. This study (1988) found no effect of activated charcoal on cholesterol levels either way. In this study (1989), seven patients got various levels of activated charcoal for 3 weeks, and the researchers noticed some impressive improvements. The lesson: there’s a little more evidence on the “pro” than the “con” side, but it’s far from conclusive and most of the trials have been very small (for example, the 1989 study used just seven subjects: that’s not enough to be anything more than preliminary. This study (1981) found that it helped. This study (1985) found that it didn’t. This study (1986) found that it helped. This study (2000) found that it didn’t. No, those are not cherry-picked specifically to make a pattern: it’s really that unclear. The lesson: nobody knows! It may or may not do anything. It’s unlikely to do you any harm (none of the studies reported worse symptoms after taking the charcoal), but it’s also quite likely to do nothing at all. An overdose can cause severe constipation. 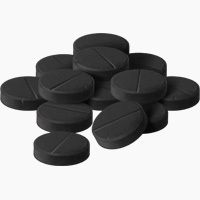 On the flip side, some activated charcoal tablets contain sorbitol, a sugar alcohol which often has a laxative effect. Activated charcoal may also prevent medicine you need from being absorbed. For example, if you’re on an antidepressant drug, taking a charcoal supplement may prevent it from working. Most people do also get black stools after taking charcoal, but this is not dangerous, just a little strange-looking. Ultimately 90% of the “benefits” of activated charcoal are imaginary. Specifically, it will not help you “detox” from anything but an acute poison ingestion. It will not help your body flush out any “accumulated toxins” from heavy metal exposure, pesticide residues, food preservatives, dyes and colorings, or anything else (not to mention that you don’t need anything to help you flush those out, since your liver already does it for you). There’s also conflicting evidence for digestive benefits and for cholesterol lowering. Some studies say yea; others say nay. Unfortunately, because the studies on activated charcoal are so conflicting, it’s easy for people to cherry-pick what they want to hear, and just throw around the ones in favor, ignoring all the evidence to the contrary. But now that you have the big picture, you can see that this is not the whole story! The bottom line: forget about it. Activated charcoal is just not worth your money. If you have acute poisoning bad enough to need it, you’ll be in the hospital anyway – and if you don’t, there’s no evidence that it does any good.